The Republic of Zambia is a landlocked country in Southern Africa, neighbouring the Democratic Republic of the Congo to the north, Tanzania to the north-east, Malawi to the east, Mozambique, Zimbabwe, Botswana and Namibia to the south, and Angola to the west. 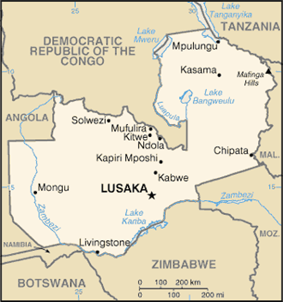 The capital city is Lusaka, in the south-central part of the country. The population is concentrated mainly around Lusaka in the south and the Copperbelt Province to the northwest. Originally inhabited by Khoisan peoples, the region was colonised during the Bantu expansion of the thirteenth century. After visits by European explorers in the eighteenth century, Zambia became the British protectorate of Northern Rhodesia towards the end of the nineteenth century. For most of the colonial period, the country was governed by an administration appointed from London with the advice of the British South Africa Company. On 24 October 1964, the country became independent of the United Kingdom and then-prime minister Kenneth Kaunda became the inaugural president. Kaunda's socialist United National Independence Party (UNIP) maintained power from 1964 until 1991. From 1972 to 1991 Zambia was a single-party state with the UNIP as the sole legal political party under the motto 'One Zambia, One Nation'. Kaunda was succeeded by Frederick Chiluba of the social-democratic Movement for Multi-Party Democracy in 1991, beginning a period of social-economic growth and government decentralisation. Levy Mwanawasa, Chiluba's chosen successor, presided over the country from January 2002 until his death in August 2008, and is credited with campaigns to reduce corruption and increase the standard of living. After Mwanawasa's death, Rupiah Banda presided as Acting President before being elected President in 2008. Holding office for only three years, Banda stepped down after his defeat in the 2011 elections by Patriotic Front party leader Michael Chilufya Sata. The territory of what is now Zambia was known as Northern Rhodesia from 1911. It was renamed Zambia on the occasion of its independence, in 1964. The new name of Zambia was derived from the Zambezi river (Zambezi may mean "God's river") which has its source in the Kaleni hills of the North western region of the country flowing west and forms its southern border. The area of modern Zambia was inhabited by Khoisan until around AD 300, when the migrating Bantu began to settle around these areas. In the 12th century, major waves of Bantu-speaking immigrants arrived during the Bantu expansion. Among them, the Tonga people (also called Ba-Tonga, "Ba-" meaning "men") were the first to settle in Zambia and are believed to have come from the east near the "big sea". At the end of the 18th century, some of the Mbunda migrated to Barotseland, Mongu. upon the migration of among others, the Ciyengele The Aluyi and their leader, the Litunga Mulambwa, especially valued the Mbunda for their fighting ability. 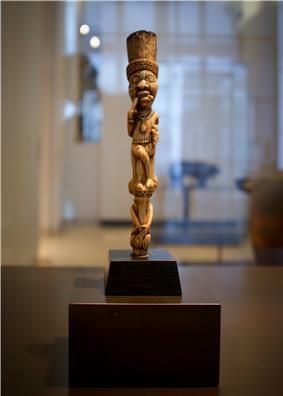 In the early 19th century, the Nsokolo people settled in the Mbala district of Northern Province. During the 19th century, the Ngoni and Sotho peoples arrived from the south. By the late 19th century, most of the various peoples of Zambia were established their current areas. The arrival of Europeans was one more such influx. 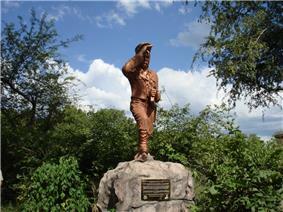 A statue of Scottish explorer David Livingstone on the Zambian side of Victoria Falls. The earliest European to visit the area was Portuguese explorer Francisco de Lacerda in the late 18th century. This territory, located between Portuguese Mozambique and Portuguese Angola, was claimed and explored by Portugal in that period. Other European visitors followed in the 19th century. The most prominent of these was David Livingstone, who had a vision of ending the slave trade through the "3 Cs": Christianity, Commerce and Civilization. He was the first European to see the magnificent waterfalls on the Zambezi River in 1855, naming them "Victoria Falls" after Queen Victoria. He described them thus: "Scenes so lovely must have been gazed upon by angels in their flight". 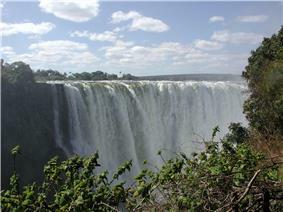 Locally the falls are known as "Mosi-o-Tunya" or "thundering smoke" in the Lozi or Kololo dialect. The town of Livingstone, near the Falls, is named after him. Highly publicised accounts of his journeys motivated a wave of European visitors, missionaries and traders after his death in 1873. 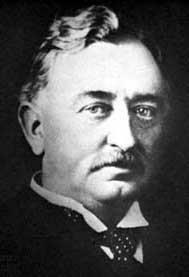 In 1888, the British South Africa Company (BSA Company), led by Cecil Rhodes, obtained mineral rights from the Litunga, the Paramount Chief of the Lozi or Ba-rotse for the area which later became North-Western Rhodesia. To the east, in December 1897 a group of the Angoni or Ngoni (originally from Zululand) rebelled under Tsinco, son of King Mpezeni, but the rebellion was put down, and Mpezeni accepted the Pax Britannica. That part of the country then came to be known as North-Eastern Rhodesia. In 1895, Rhodes asked his American scout Frederick Russell Burnham to look for minerals and ways to improve river navigation in the region, and it was during this trek that Burnham discovered major copper deposits along the Kafue River. That same year, Southern Rhodesia (now Zimbabwe), a conquered territory which was also administered by the BSA Company, became a self-governing British colony. In 1924, after negotiations, administration of Northern Rhodesia transferred to the British Colonial Office. In 1953, the creation of the Federation of Rhodesia and Nyasaland grouped together Northern Rhodesia, Southern Rhodesia and Nyasaland (now Malawi) as a single semi-autonomous region. This was undertaken despite opposition from a sizeable minority of the population, who demonstrated against it in 1960–61. Northern Rhodesia was the centre of much of the turmoil and crisis characterising the federation in its last years. Initially, Harry Nkumbula's African National Congress (ANC) led the campaign, which Kenneth Kaunda's United National Independence Party (UNIP) subsequently took up. A two-stage election held in October and December 1962 resulted in an African majority in the legislative council and an uneasy coalition between the two African nationalist parties. The council passed resolutions calling for Northern Rhodesia's secession from the federation and demanding full internal self-government under a new constitution and a new National Assembly based on a broader, more democratic franchise. The federation was dissolved on 31 December 1963, and in January 1964, Kaunda won the only election for Prime Minister of Northern Rhodesia. The Colonial Governor, Sir Evelyn Hone, was very close to Kaunda and urged him to stand for the post. Soon after, there was an uprising in the north of the country known as the Lumpa Uprising led by Alice Lenshina – Kaunda's first internal conflict as leader of the nation. 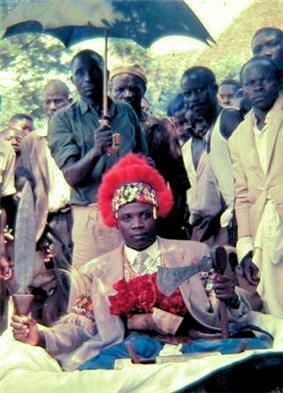 Mwata Kazembe XVII Paul Kanyembo Lutaba, king of the Lunda people in Zambia in 1961. 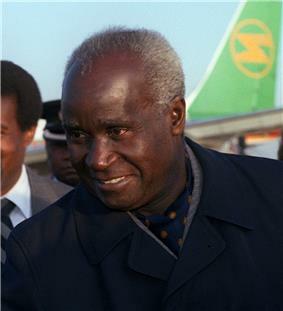 Kenneth Kaunda served as Zambia's first president from 1964 to 1991. Kaunda's endorsement of Patriotic Front guerrillas conducting raids into neighbouring (Southern) Rhodesia resulted in political tension and a militarisation of the border, leading to its closure in 1973. However, the Kariba hydroelectric station on the Zambezi River provided sufficient capacity to satisfy the country's requirements for electricity, despite Rhodesian management. A railway to the Tanzanian port of Dar es Salaam, built with Chinese assistance, reduced Zambian dependence on railway lines south to South Africa and west through an increasingly troubled Portuguese Angola. Until the completion of the railway, however, Zambia's major artery for imports and the critical export of copper was along the TanZam Road, running from Zambia to the port cities in Tanzania. The Tazama oil pipeline was also built from Dar es Salaam to Ndola in Zambia. By the late 1970s, Mozambique and Angola had attained independence from Portugal. Rhodesia's predominantly white government, which issued a Unilateral Declaration of Independence in 1965, accepted majority rule under the Lancaster House Agreement in 1979. Zambia's problems, however, were far from over. Civil strife in both Portuguese colonies and a mounting Namibian War of Independence resulted in an influx of refugees and compounded transportation issues. The Benguela railway, which extended west through Angola, was essentially closed to Zambian traffic by the late 1970s. Zambia's support for anti-apartheid movements such as the African National Congress (ANC) also created security problems as the South African Defence Force struck at dissident targets during external raids. Zambia is divided into ten provinces, each administered by an appointed deputy minister. Each province is subdivided into several districts with a grand total of 89 districts. The Zambian Defence Force (ZDF) consists of the army, the air force, and Zambian National Service (ZNS).The ZDF is designed primarily against external threats. Eastern Zambia shows great diversity. The Luangwa Valley splits the plateau in a curve north east to south west, extended west into the heart of the plateau by the deep valley of the Lunsemfwa River. Hills and mountains are found by the side of some sections of the valley, notably in its north-east the Nyika Plateau (2,200 m or 7,218 ft) on the Malawi border, which extend into Zambia as the Mafinga Hills, containing the country's highest point, Mafinga Central (2,339 m or 7,674 ft). The Muchinga Mountains, the watershed between the Zambezi and Congo drainage basins, run parallel to the deep valley of the Luangwa River and form a sharp backdrop to its northern edge, although they are almost everywhere below 1,700 m (5,577 ft). Their culminating peak Mumpu is at the western end and at 1,892 m (6,207 ft) is the highest point in Zambia away from the eastern border region. The border of the Congo Pedicle was drawn around this mountain. The climate of Zambia is tropical, modified by elevation. In the Köppen climate classification, most of the country is classified as humid subtropical or tropical wet and dry, with small stretches of semi-arid steppe climate in the south-west and along the Zambezi valley. Zambia is one of the most highly urbanised countries in sub-Saharan Africa with 44% of the population concentrated in a few urban areas along the major transport corridors, while rural areas are sparsely populated. Unemployment and underemployment in urban areas are serious problems, while most rural Zambians are subsistence farmers. The population comprises approximately 72 ethnic groups, most of which are Bantu-speaking. According to government surveys, Fertility rate was 6.2 as of 2007 (6.1 in 1996, 5.9 in 2001-02). Almost 90% of Zambians belong to the nine main ethnolinguistic groups: the Nyanja-Chewa, Bemba, Tonga, Tumbuka, Lunda, Luvale, Kaonde, Nkoya and Lozi. In the rural areas, each ethnic group is concentrated in a particular geographic region of the country and many groups are very small and not as well known. However, all the ethnic groups can be found in significant numbers in Lusaka and the Copperbelt. The Europeans in the Colony numbered 14,000 at the 1931 census and the Africans 1,400,000, or just one hundred times as many. Of the Europeans, more than 10,000 had entered the country in the previous ten years, since the census in 1921 (mostly to work on the copper mines). In 1938 there were only eight doctors in the entire country. The official language of Zambia is English, which is used to conduct official business and is the medium of instruction in schools. The main local language, especially in Lusaka, is Nyanja. However, Bemba and Nyanja are spoken in the urban areas in addition to other indigenous languages which are commonly spoken in Zambia. Others are Lozi, Kaonde, Tonga, Lunda and Luvale, which feature on the Zambia National Broadcasting Corporation (ZNBC)'s local languages section. The total number of languages spoken in Zambia is 73. Most will thus speak Bemba and Nyanja in the Copperbelt; Nyanja is dominantly spoken in Lusaka and Eastern Zambia. English is used in official communications and is the chosen language at home among – now common – intertribal families. If one does visit Zambia it becomes evident that language continuously evolves and has led to Zambian slang which can be heard in daily life throughout Lusaka and other major cities. Intentions of introducing other languages, like Portuguese, into the school curriculum have been discussed by the government. French is commonly studied in private schools, while some secondary schools have it as an optional subject. A German course has been introduced at the University of Zambia (UNZA). Zambia is officially a Christian nation according to the 1996 constitution, but a wide variety of religious traditions exist. Traditional religious thoughts blend easily with Christian beliefs in many of the country's syncretic churches. Christian denominations include: Catholic, Anglican, Pentecostal, New Apostolic Church, Lutheran, Jehovah's Witnesses, Seventh-day Adventist, The Church of Jesus Christ of Latter-day Saints, and a variety of Evangelical denominations. These grew, adjusted and prospered from the original missionary settlements (Portuguese and Catholicism in the east from Mozambique) and Anglicanism (British influences) from the south. Except for some technical positions (e.g. physicians), Western missionary roles have been assumed by native believers. After Frederick Chiluba (a Pentecostal Christian) became President in 1991, Pentecostal congregations expanded considerably around the country. Approximately 87% of the population are Christians. It has one of the largest percentage of Seventh-day Adventist per head in the world, about 1 in 18 Zambians. 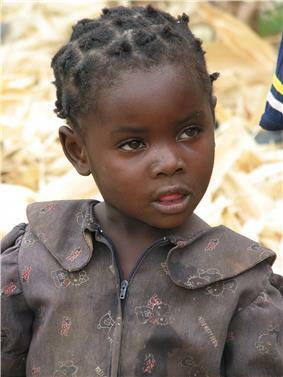 The Baha'i population of Zambia is over 160,000, or 1.5% of the population. The William Mmutle Masetlha Foundation run by the Baha'i community is particularly active in areas such as literacy and primary health care. Approximately 1% of the population are Muslims with most living in urban areas and play a large economic role in the country, of which about 500 belong to the Ahmadiyya sect in Islam. There is also a small Jewish community, composed mostly of Ashkenazis. Notable Jewish Zambians include Simon Zukas, retired Minister, MP and a member of Forum for Democracy and Development and earlier on the Movement for Multiparty Democracy (MMD) and United National Independence Party. Additionally, the economist Stanley Fischer, currently the vice chair of the U.S. Federal Reserve System and formerly the governor of the Bank of Israel and formerly Deputy managing director of the International Monetary Fund (IMF) was born and partially raised in Zambia's Jewish community. The Bank of Zambia serves as the Central Bank which implements monetary policies for the country. The Ministry of Commerce, led by Minister Robert K Sichinga, maintains statistics regarding the domestic and international trade for the Republic of Zambia. Presently, Zambia averages between $7 billion and $8 billion of exports annually. About 68% of Zambians live below the recognised national poverty line, with rural poverty rates standing at about 78% and urban rates of 53%. Zambia ranked 117th out of 128 countries on the 2007 Global Competitiveness Index, which looks at factors that affect economic growth. Social indicators continue to decline, particularly in measurements of life expectancy at birth (about 40.9 years) and maternal mortality (830 per 100,000 pregnancies). The country's rate of economic growth cannot support rapid population growth or the strain which HIV/AIDS-related issues place on the economy. 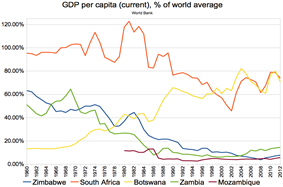 Zambia fell into poverty after international copper prices declined in the 1970s. The socialist regime made up for falling revenue with several abortive attempts at International Monetary Fund structural adjustment programmes (SAPs). The policy of not trading through the main supply route and line of rail to the sea - the territory controlled as Rhodesia (from 1965 to 1979), now known as Zimbabwe - cost the economy greatly. After the Kaunda regime, (from 1991) successive governments began limited reforms. The economy stagnated until the late 1990s. In 2007 Zambia recorded its ninth consecutive year of economic growth. Inflation was 8.9%, down from 30% in 2000. Zambia is still dealing with economic reform issues such as the size of the public sector and improving Zambia's social sector delivery systems. Economic regulations and red tape are extensive, and corruption is widespread. The bureaucratic procedures surrounding the process of obtaining licences encourages the widespread use of facilitation payments. Zambia's total foreign debt exceeded $6 billion when the country qualified for Highly Indebted Poor Country Initiative (HIPC) debt relief in 2000, contingent upon meeting certain performance criteria. Initially, Zambia hoped to reach the HIPC completion point, and benefit from substantial debt forgiveness, in late 2003. ^ a b Brunner, Borgna (ed.). TIME Almanac 2004 (2004 ed.). Pearson Education, Inc. pp. 875–905. ^ "Welcome – Central Statistical Office, Zambia – national statistics from the Government of the Republic of Zambia". Zamstats.gov.zm. Retrieved 18 December 2012. ^ Central Statistical Office, Government of Zambia. "2010 Census Population Summaries". Archived from the original on 2012-01-21. Retrieved 13 November 2012. ^ a b c d "Zambia". International Monetary Fund. Retrieved 18 April 2013. ^ "United Nations Statistics Division- Standard Country and Area Codes Classifications (M49)". Unstats.un.org. 2013-10-31. Retrieved 2014-04-11. ^ Holmes, Timothy (1998). Cultures of the World: Zambia. Tarrytown, New York: Times Books International. pp. 19–20. ^ Raeburn, Michael (1978). We are everywhere: Narratives from Rhodesian guerillas. Random House. pp. 1–209. ^ Nelson, Harold (1983). Zimbabwe: A Country Study. Claitors Publishing Division. pp. 54–137. ^ Kaplan, Irving (1971). Area Handbook for the Republic of South Africa. U.S. Govt. Print. Office. pp. 404–405. ^ Evans, M. (1984–5). "The Front-Line States, South Africa and Southern African Security: Military Prospects and Perspectives". Zambezia 12: 1. ^ Beilfuss, Richard and dos Santos, David (2001) "Patterns of Hydrological Change in the Zambezi Delta, Mozambique". Working Paper No 2 Program for the Sustainable Management of Cahora Bassa Dam and The Lower Zambezi Valley. ^ Camerapix: "Spectrum Guide to Zambia." Camerapix International Publishing, Nairobi, 1996. ^ "Welcome to the Official site of Zambian Statistics". Zamstats.gov.zm. Retrieved 2014-04-11. ^ "Zim's Loss, Zam's gain: White Zimbabweans making good in Zambia". The Economist. June 2004. Retrieved 28 August 2009. ^ Thielke, Thilo (27 December 2004). 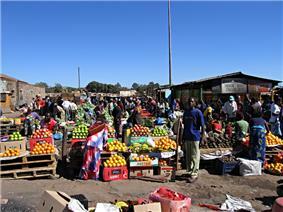 "Settling in Zambia: Zimbabwe's Displaced Farmers Find a New Home". ^ a b "World Refugee Survey 2009". U.S. Committee for Refugees and Immigrants. ^ Lewin, Julius (1941). The Colour Bar in the Copper Belt. Southern African Committee on Industrial Relations. Archived from the original on 2011-05-11. ^ Zambia to introduce Portuguese into school curriculum. ^ Steel, Matthew (2005). Pentecostalism in Zambia : Power, Authority and the Overcomers. University of Wales. MSc Dissertation. ^ Some basics of religious education in Zambia. Retrieved March 30, 2014. ^ Development Indicators Unit, Statistics Division, United Nations. "Population below national poverty line, total, percentage". Retrieved 30 October 2007. ^ Development Indicators Unit, Statistics Division, United Nations. "Population below national poverty line, rural, percentage". Retrieved 30 October 2007. ^ Development Indicators Unit, Statistics Division, United Nations. "Population below national poverty line, urban, percentage". Retrieved 30 October 2007. ^ "Zambia Country Brochure". World Bank. ^ Pennysharesonline.com, City Equities Limited (14 July 2006). "Albidon signs agreement with Zambian government". Archived from the original on 2007-03-12. Retrieved 30 October 2006. ^ United Nations High Commissioner for Refugees. "Refworld | Zambia: Government treatment of homosexuals in Zambia, and its attitudes towards gay organisations; protection or support available from human rights groups". UNHCR. Retrieved 18 December 2012. ^ Riddell, Abby (2003). "The introduction of free primary education in sub-Saharan Africa". UNESCO. Retrieved 30 October 2007. ^ "Central Intelligence Agency". Cia.gov. Retrieved 18 December 2012. ^ OLPC Zambia - OLPC. Wiki.laptop.org. Retrieved on 7 December 2013. ^ Forecast provided by International Futures. Historic data points from the World Bank. ^ "CIA - The World Factbook Life Expectancy". Cia.gov. Retrieved 2014-06-24. ^ "UNAIDS World AIDS Day Report 2011". UNAIDS. ^ David Smith in Lusaka. "Chinese hospital heals sore spot in Zambia | Global development". theguardian.com. Retrieved 2014-04-11. The Zambian staple diet is based on maize. It is normally eaten as a thick porridge, called nshima (Nyanja Word), prepared from maize flour, commonly known as mealie meal. In some regions of Zambia, "nshima" is made from dried, pounded cassava root that is sifted into a flour and whipped in hot water. This "nshima" has almost no nutritional value, but is very common in the poor villages of Northwestern, Northern, and Luapula regions of Zambia. "Nshima" may be eaten with a variety of vegetables, beans, meat, insects, fish or sour milk depending on geographical location/origin. Traditional culture is very visible through colourful annual Zambian traditional ceremonies. Some of the more prominent are: Kuomboka and Kathanga (Western Province), Mutomboko (Luapula Province), Ncwala (Eastern Province), Lwiindi and Shimunenga (Southern Province), Lunda Lubanza (North Western), Likumbi Lyamize (North Western), Mbunda Lukwakwa (North Western Province), Chibwela Kumushi (Central Province), Vinkhakanimba (Muchinga Province), Ukusefya Pa Ng’wena (Northern Province). In 2009, Zambia generated 10.3 Twh and has been rated high in use of both Solar power and Hydroelectricity. In June 2011, the United Nations Population Fund released a report on The State of the World's Midwifery. It contained new data on the midwifery workforce and policies relating to newborn and maternal mortality for 58 countries. The 2010 maternal mortality rate per 100,000 births for Zambia is 470. This is compared with 602.9 in 2008 and 594.2 in 1990. The under-5 mortality rate, per 1,000 births is 145 and the neonatal mortality as a percentage of under 5's mortality is 25. The aim of this report is to highlight ways in which the Millennium Development Goals can be achieved, particularly Goal 4 – Reduce child mortality and Goal 5 – improve maternal death. In Zambia the number of midwives per 1,000 live births is 5 and the lifetime risk of death for pregnant women is 1 in 38. Female genital mutilation (FGM), while not widespread, is practiced in parts of the country. According to the 2009 Zambia Sexual Behaviour Survey, 0.7% of women have undergone FGM. According to UNICEF, 45% of children under five years are stunted. In Zambia, there are three universities and several technical schools that provide higher education. The Ministry of Science Technology and Vocational Training (MSTVT) in Zambia was also developed in 1992 to foster growth in technological fields. 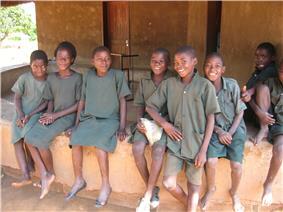 However, educational opportunities beyond secondary school are limited in Zambia. After secondary school, most students study at the various colleges, around the country. 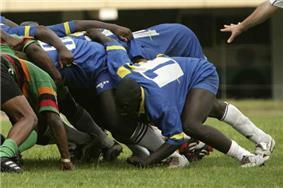 Normally they all select students on the basis of ability; competition for places is intense. The introduction of fees in the late 1990s has made university level education inaccessible for some, although the government does provide state bursaries. Copperbelt University opened in the late 1980s, taking over most of the former Zambia Institute of Technology site in Kitwe. There are also several teacher training colleges offering two-year training programmes, while missionary hospitals around the country offer internationally acceptable training for nurses. Several Christian schools offer seminary-level training. In Zambia, the education system consists of both government and private schools. Historically, the private school system began largely as a result of Christian mission efforts during the late 19th and early 20th centuries. In schools, a student may initially receive two levels of education; basic education (years 1 to 9), and upper secondary (years 10 to 12). Some schools provide a "basic" education covering years 1 to 9, as year 9 is considered to be a decent level of education for the majority of children. UNESCO estimated that 80% of children of primary school age in 2002 were enrolled. In 2003, the adult literacy rate was estimated to be 80.6% (86.8% male and 74.8% female). Zambia has a first OLPC - One Laptop Per Child - deployment at the new Zambian library that is in traditional Zambian Style. Social protection for LGBT is non-existent in Zambia and any expression thereof is illegal. better co-ordination between different implementers and programmes. Public works, such as PUSH, and cash transfers are the main instruments used to protect consumption among low-capacity households by providing (1) seasonal safety nets to address cyclical poverty and vulnerability at times of need by offering employment and (2) community assets that are beneficial for productive activities. In practice, however, the programme prioritises food transfers to areas affected by natural disasters where vulnerability is acute and infrastructure development has remained a secondary objective. NGOs also have implemented short-term public works programmes implemented by NGOs, such as CARE's agricultural inputs-for-assets (AICA) programme. Zambia officially has extensive social protection targeted at low-capacity households, including social assistance (protection) and social insurance programmes (prevention), and programmes to improve economic productivity (promotion). However, these programmes face immense challenges and the actual coverage is very low and, in some cases, actually declining. Some analysts describe the programmes' coverage as patchy and transitory and not especially coherent or logical. Zambia co-hosted the UNWTO 2013 General Assembly from 24 to 29 August 2013 and used the event to showcase its suitability for tourism and the Meetings, incentives, conferencing, exhibitions industry. 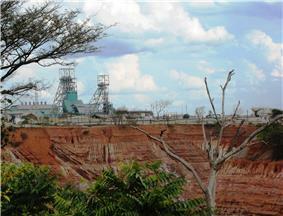 The Zambian economy has historically been based on the copper mining industry. Output of copper had fallen, however, to a low of 228,000 metric tons in 1998, after a 30-year decline in output due to lack of investment, low copper prices, and uncertainty over privatisation. In 2002, following privatisation of the industry, copper production rebounded to 337,000 metric tons. Improvements in the world copper market have magnified the effect of this volume increase on revenues and foreign exchange earnings. 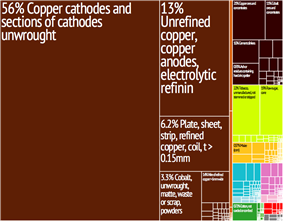 Graphical depiction of Zambia's product exports in 28 color-coded categories.